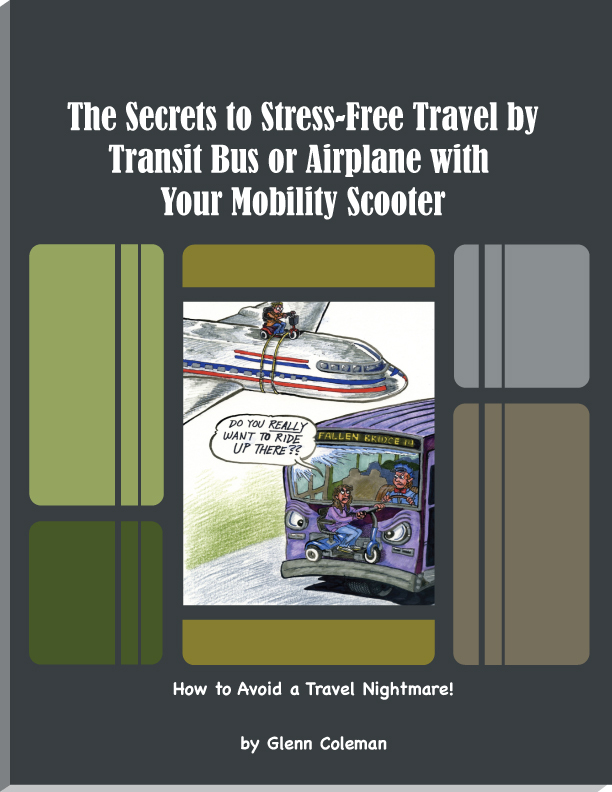 Do You Know The Top Five Obstacles in Your Way of Having a Smooth Trip With Your Mobility Scooter When Traveling by Bus or Plane? Each airline and bus company has different policies on traveling with a mobility scooter. We’ve simplified this by letting you know exactly what to ask your travel agent, airline, or bus company. And what not to do. Don’t let your next vacation or outing end on the tarmac or at a bus stop! Get your copy today! I have found internationally that if you call to get pre-approval of a lithium battery, everyone reads the same regulations, but interprets it differently. A person can be stopped at 4 points in a trip – when checking in the clerk has the right to tell you what needs to be done. When they are wrong, I have provided them with written instructions from the airline (learned after many challenges). When going through security – in Bali with Singapore Airlines & Abu Dubai with Emirates, no matter what I was told prior to going to the airport by airport people, the rules changed when I arrived at the airport. Singapore refused to allow the lithium battery on the plane, although they did allow the scooter. Emirates told me that I must carry the battery (although the solax scooter folded into luggage size IF the battery was attached). Then they changed their mind, said it must stay with the scooter, and that I had to buy plastic wrapping around the scooter. When I got to the US United demanded it be unwrapped and that I take the batteries with me onto the plane to go from NYC to Indiana. In China, they wrapped the scooter with the batteries intact – wrapped the entire scooter many times with a band that had to be cut with scissors. They dropped me off at the scooter and told me to drive it out to pick up luggage – however, they did not provide any way to cut the straps. I was in foreign countries for two months and had such interesting experiences that would make a normal traveler stop traveling. Thanks for sharing your experiences traveling with scooter. You’re a good role model of how to get there despite the confusion!